Buenos Aires, the Argentine capital city, will host the 2018 Youth Olympic Games, in 2020, its Japanese counterpart will stage the 2020 Olympic Games; some months ago the International Table Tennis Federation announced the “Buenos Aires – Tokyo, bridging the Olympic Games” concept. The aim of the project, made possible thanks to support from Stag, the Foundation for Global Sports Development and the newly established ITTF Foundation, is to leave a legacy that focuses on young people who reside in poor social areas. Recently, thanks to the support of Olympic Solidarity and in co-ordination with World Table Tennis Day, Japan’s Isao Nakandarake crossed the bridge. He travelled to Buenos Aires. 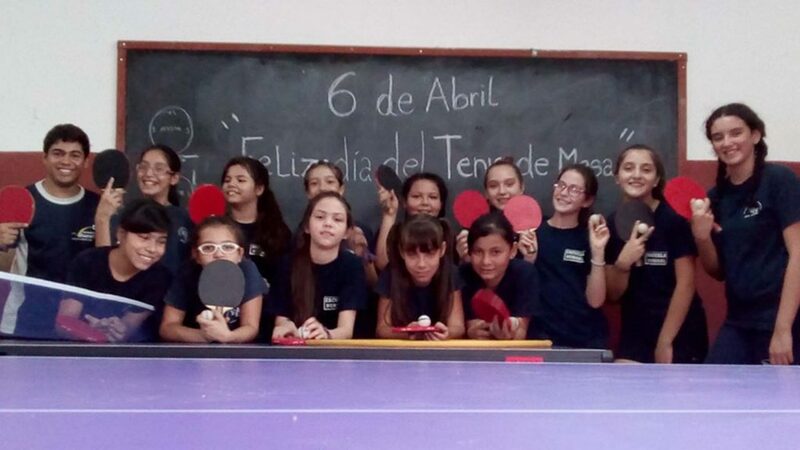 He visited two Japanese clubs and two state organised schools in the suburbs of Buenos Aires, the schools being close to the venue for the table tennis events at the forthcoming Youth Olympic Games. Additionally he visited the Centre for Cultural and Sporting Events, before travelling to a school in the Province of Misiones, some 1,000 kilometres from the city, where he was able to hold discussion with Rafa Morgenstern, the region’s Sports Minister. During his visit to Argentina, in addition to holding discussions with Rafa Morgenstern; Isao Nakandarake held meetings with distinguished local officials. Notably he met Noriteru Fukushima, the Japanese Ambassador in Buenos Aires, Nestor Tenca, ITTF Executive Vice President and Gustavo Levisman, Argentine National Coach. A busy schedule for Isao Nakandarake; it was also a busy time for the Argentina Table Tennis Federation; a total of 19 events were staged in the country on World Table Tennis Day; it was also the day Isao Nakandarake departed the country.